Thanks to the Connell Fund there are 72 new handbook, international handbook, companion, and history titles available for Cambridge University users on Routledge Handbooks Online. These have all been selected by Faculty and Departmental librarians and they cover the following subjects: Anthropology, Archaeology & Classics, Business & Economics, Communication Journalism Media & Culture, Development Studies, Education, Environment & Sustainability, History, Linguistics, Middle East Studies, Philosophy, Politics, Psychology, Religion, Security Studies, and Sociology. These new titles complement the existing collection on the Routledge Handbooks Online platform and bring the number of accessible titles up to 502. All titles are free of Digital Rights Management (DRM) and available in PDF and HTML format. All chapters have an accompanying abstract. The titles are available on and off campus (using a Raven login) and all of them are searchable in iDiscover. You are also able to filter your searches on the platform so that only “full access only” (owned) titles and chapters are displayed. If you have any queries please contact Jayne and Lindsay in the ebooks team at ebooks@lib.cam.ac.uk. The ebooks@cambridge team is pleased to announce that 109 new handbooks are now available to Cambridge University members via Routledge Handbooks Online. These new titles have been selected by Faculty and Departmental librarians from the 2015 and 2016 collections and cover a wide range of subjects: Anthropology, Archaeology & Classics, Asian Studies, Business, Communication, Education, Environment & Sustainability, Geography, History, Literature, Middle East Studies, Philosophy, Politics, Psychology, Religion, Sociology and South Asian Studies. 94 of the new titles have been funded by the Connell Fund, which was also used for our recent acquisition of new ebook collections from Bloomsbury Collections, about which we posted recently. Below is a selection of these titles. Click on the covers to access the ebooks via authenticated links. You can see a complete list of these 94 new titles by downloading RHO title selection Connell 2016-17. Routledge Handbooks bring together the world’s leading scholars to provide a cutting-edge overview of classic and current research and future trends in the Social Sciences and Humanities, while at the same time providing an authoritative guide to theory and method, the key sub-disciplines, and the primary debates of today. The online versions are available DRM-free, as HTML and pdf files, and are fully searchable thanks to the platform’s search tools and rich meta-data, including abstracts for each chapter. The Routledge Handbooks Online platform can be accessed on and off-campus here. Records for the new and existing individual handbooks will be listed within iDiscover within the next few days. As ever, please send your comments or queries about this platform or any other aspect of ebook provision to ebooks@lib.cam.ac.uk. The ebooks team is pleased to announce that, thanks to a collaborative purchase by Cambridge libraries, all Cambridge staff and students can now access the entire Routledge Handbooks Online collection. Available subject collections include Asian Studies, Education, History, Linguistics, Philosophy, Politics & International Relations, and Sociology. Routledge Handbooks Online (RHO) is available on and off campus (via Raven login) from this link. All RHO titles are available for searching in LibrarySearch. Click on the book covers to link directly to a selection of RHO titles. 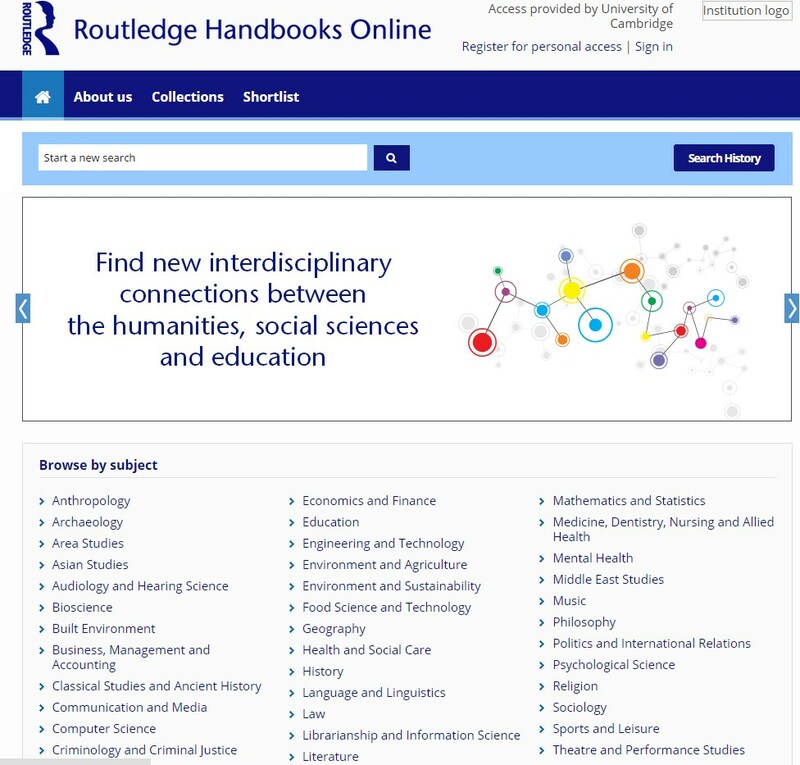 The ebooks team is pleased to announce that all Cambridge staff and students can now access the newly launched Routledge Handbooks Online collection. This new platform provides access to Routledge Handbooks, Companions and Worlds publications.This free 60 day trial enables you access to over 15,000 chapters from 325+ available volumes sorted into 18 subject collections. Available subject collections include Asian Studies, Education, Linguistics, Philosophy and Sociology. This trial will end on Thursday 12th March, so please do send any comments on the usability of the platform and the content to ebooks@lib.cam.ac.uk before this date. The ebooks team is very interested in how useful you find this collection to your studies and research. Life as a Librarian and all the thrills along the way! Borrowing e-books from your library is great - and we want to make it even better.